We all want a fit and healthy life but when it comes to exercise & diet plans, we get worried and before even starting. Well, exercise is all about peoples will. But the good news is, from now, you don’t have to worry about having fruits and vegetables like before. I get worried when I thinking of having the bitter taste of vegetables and fruits. But, in this modern generation, we came across to a new dimension of blending. The whole new and improved Ninja Blender Duo with Auto-IQ. The 1500 Watts blender beats the ordinary blenders in the market with its immense power. The Ninja Blender Duo with Auto-IQ designed as a nutrient extractor features five Pre-Set Auto-IQ programs. The 1,500-watt motor makes it more powerful than other ordinary blenders. It will give you the ability to extract and bring out the complete nutrition from your food. Also, the total Crushing Technology provides all the options for blending, smoothing and it makes more amazing things for you. These things make it one of the best smoothie blenders in the market with all other different functions. Rachel Beller “Eat to Lose, Eat to Win” Healthy Living Book. Auto-IQ technology also with manual programs. It’s very loud for its motor power. Different sized cups with sip & seal lids. Sometimes, it heats up. Easy to clean up. Sometimes it does not blend in proper way. Powerful 1500 watt/ 2 HP power base motor. It’s quite big in size comparing to other blenders. Pulse feature. Has some design flaws. 1500 watt/2 HP motor!! Can you imagine how much power this thing has a blender! The Ninja Blender Duo with Auto-IQ completely extracts all the essential nutrition from fruits & vegs. The earlier versions had a lower motor power base. But now, the power is 1500 Watts, which can do the extraction work very fast without any doubts. It has created plenty of blending and extraction opportunities which leads us to a perfect and healthy lifestyle. It elevates the guesswork for making tasty and delicious smoothies and preparing foods. It is a Full-sized counter-top blender with 5 Auto-IQ functionality. The Auto-IQ calculates the timing of blending which provides the perfect food & smoothies. It can recognize the size of container which makes blending easier. It has a timer display for Auto-IQ settings so that you can see and even adjust the time. Besides, you don’t have to mix, stir or shake the container after blending. The blender comes with many jars and pitchers. Also, these are easy to assemble. Because of the Auto-IQ technology, the blending process has become easier. The blender even recognizes the container. You only need to fit the container, add the fruits and vegetables as you want and press on the Auto-IQ functions. It’s that simple. Also for the users’ choice of timing and speed, there are 3 manual functions to adjust the speed and timing. The Ninja Blender Duo with Auto-IQ is not only designed for making delicious smoothies, you can also do many other things. It can do puree, grind, mix and crush fruits, vegetable, ingredients and can crush ice into snow. You don’t need any separate machines or blenders for doing these things in your kitchen. The Ninja Blender Duo with Auto-IQ has 3 different modes to use with: Low, Medium, and High. According to the type of food item, you can change the modes and 3 different speeds to get the preferred result. Along with Auto-IQ technology, this feature gives the independence of customization. You can start or stop the blending at any time with this function. The 1500 watt Power Base makes the most delicious smoothies and drinks you can ever get from a blender. The Auto-IQ technology programs the blending functions which gives the best results every time. 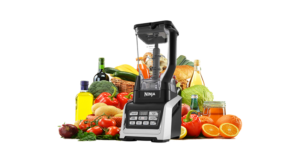 The blender has 5 Auto-IQ programs & 3 Manual programs. The Ninja Blender Duo with Auto-IQ blender can recognize the type and size of the container. It also has manual customization options. The Pro Extractor Blade blends the whole fruits, vegetables at once. Also, it can extract, grinds, mix the food items at the correct way without even looking at it. The Ninja Blender Duo with Auto-IQ can blend ice and frozen fruit in a moment. It can turn solid ice to soft snow. The blender contains Cups with Sip & Seal Lids in three different sizes. The container, blades, jars, and lids completely BPA free and dishwasher safe. The blades are rustproof high-quality stainless steel made which is completely dishwasher-safe. It has the feature of safety interlock system designed for stable blending. The Ninja Blender Duo with Auto-IQ comes with a Program guides and recipe cookbook. It will help to understand its functions and to make delicious foods and smoothies. Nutri Ninja Duo Blenders come with 60-day refund policy and a free lifetime VIP warranty. The motor base and containers are large at the size to fit on the kitchen cabinets. The cups are too big to hold and drink from it. It is loud compared to other blenders in the market. The manual pulse has only one setting. Some fruits may not fit on the large pitcher because of the blade in the middle. Has some complaints of Seal Lids. The jars and container are not microwave-safe. It can get very gritty and pulpy. In short, I would say that the Ninja Blender Duo with Auto-IQ blender is a very powerful blender. It can be the best choice for those who want their dream fitness and healthy lifestyle. It blends the whole foods and extracts the complete nutrition inside of it. Auto-IQ technology can process the fruits and vegetables and blend them without even worrying about the timing and blend. The amazing fact of this blender is it can extracts, grinds, mix and blend anything. There might be some issues with it but these are not much serious. If you take a look at customer reviews on Amazon, you can see the experience about the customer. The customer rating says it all. 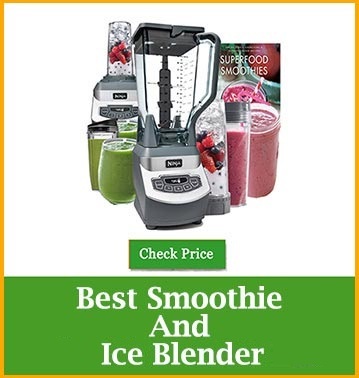 Comparing to other blenders (Vitamix or Blendtec) it will give better service at low price. Also, the blender is easy to clean and wrap up. At the end, if you are thinking of a high-end blender, I would recommend you the Ninja Blender Duo with Auto-IQ. You’ve already read the reason for it. 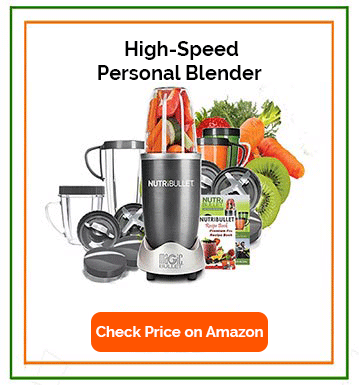 If you find this article helpful and you want to check the latest deals for Ninja Blender Duo with Auto-IQ Blender, then click on the button below. If you want blender at more efficient cost, I also suggest Nutri Ninja Auto-IQ blender BL482 for quality performance low budget blender.